The Shire of Traralgon (1879-1994) was constituted in 1879, the area previously being part of the Shire of Rosedale. In 1892, the western part of Traralgon Shire was severed to form Morwell Shire. The shire covered an area of 468 squ km and was centred on Traralgon, 160 km east of Melbourne. It stretched from the Latrobe River in the north to the ridge of the Strzelecki Ranges in the south. The southern part was hilly and heavily forested, while the rest of the shire was relatively flat and lightly timbered. Dairying and grazing were the main agricultural pursuits. 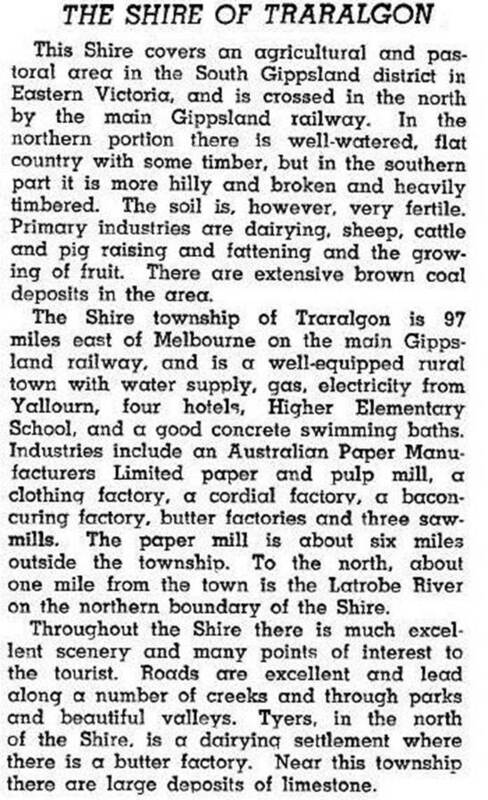 In the 1930s a paper and pulp mill was established at Maryvale, north-east of Traralgon and just outside the shire. Other industrial operations were attracted to the town in the immediate postwar years, changing its focus from an agricultural service centre to industrial city. The town’s population nearly tripled to over 12,000 between 1947 and 1961. In the late 1970s and 1980s, two new power stations were constructed at Loy Yang, south Traralgon, utilising the extensive brown coal deposits of the area. In 1961, the town became a borough, separated from the surrounding rural shire. In 1964, Traralgon was declared a city and in 1994, both shire and city were amalgamated into the shire of Latrobe, subsequently Latrobe city. In 1994 Traralgon shire had 19,200 meat cattle, 4750 dairy cattle, 29,600 sheep and 13,000 lambs.